Nothing can dampen your spirits faster than getting a water bill without knowing you have a leak somewhere in your home or business. 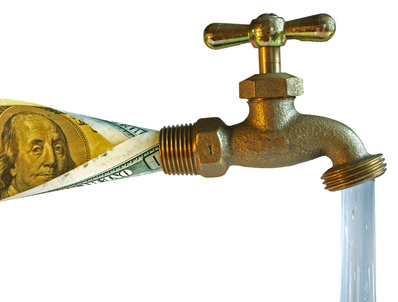 If you’ve experienced this problem, then you know how high an unchecked leak can drive your water costs. If you haven’t, pay close attention to this blog entry because it might be the difference between paying a little…or paying way, way too much on your water bill. Leaks can be insidious. Obviously, the first way we usually find leaks in our homes is by seeing it. If you’re a homeowner, periodically inspecting your walls, baseboards, ceilings, basements and attics for unseen leaks is one of the best preventive measures you can take to curb future emergency expenses. It doesn’t take a long time to do and the savings are tremendous. However, sometimes leaks aren’t so obvious. Sometimes they’re hidden away from plain site, slowly rotting out your walls from the inside or eating away at your ceiling in a spot that isn’t visible from your living areas. Leaks can lead to significantly higher water bills, sewer pipe breakage, backed up sinks, tubs and toilets and potentially pose a serious health risk. Water damage provides the perfect breeding ground for mold! Stop leaks in their tracks with Express Sewer & Drain’s Expert leak detection and location in Sacramento. In these cases, you need a professional Sacramento leak detection and location service who can help you prevent the potential damages unseen leaks can cause. At Express Sewer & Drain, we specialize in finding even the tiniest, most hidden away leaks in your home or office. We recommend that you include Sacramento leak detection and leak location services in your Express maintenance routine. As part of your plumbing inspection and services, providing for leak detection can save you considerable time and money down the line. Emergencies do happen, but you can greatly increase the chances they won’t through Express Sewer & Drain’s maintenance plan and our expert Sacramento leak detection specialists. Listening for unusual sounds in your walls and checking for warm spots on your flooring are also ways to check for leaks. Pipes may moan and groan when pressurized abnormally, sometimes pointing to the possibility you have a leak. Warm spots on floors often indicates a sub-floor leak. Another way to check for leaks in your home is smell. Is there a mysterious mildew odor anywhere inside your home. Have you tried to find it only to come up empty? Call the Sacramento leak detection experts right now! Are you wondering if any plumbers in Sacramento perform leak detection services? Call Express Sewer & Drain to find out how we can help fast. And finally, as we mentioned above, you may also notice that your water bill suddenly rises. Don’t get washed away by a flood of expense! This is a strong indicator that you might have a leak in your home. Though many leaks are conspicuous, many others aren’t. But there’s simply too much at risk by ignoring it and hoping it just goes away. We’re always available and at the ready if you need us for any Sacramento leak detection or plumbing emergency. And don’t worry! We will never charge you extra for any service call that’s afterhours or on weekends or holidays. Count on us to find your Sacramento leak!